What is it that makes life beautiful? Is life beautiful? Do you ever ask yourself these questions? I do. You tend to, when at 24 life has taken you through hell and back. Life for me is most beautiful at the break of day, when the sun lights the sky in pink streaks. I’ve just been on vacation. 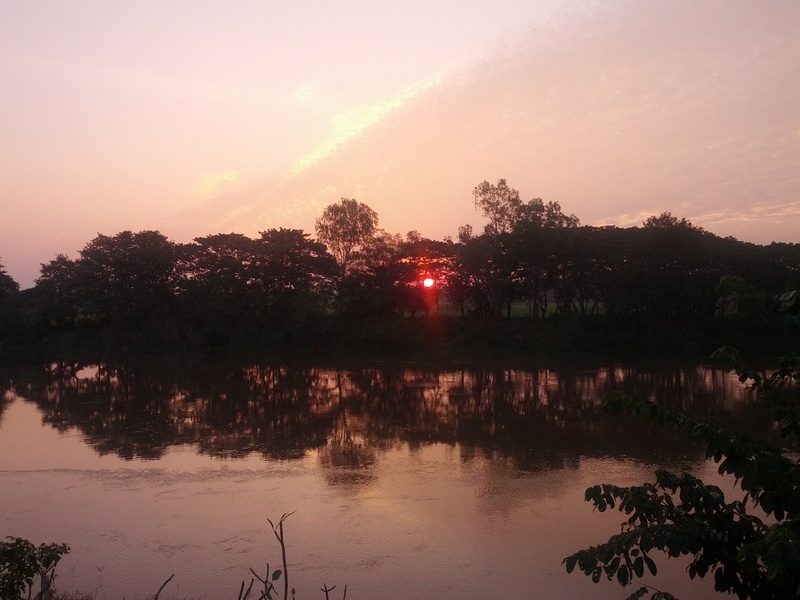 And I loved sitting by the river watching night turn to day, the sky bathed in pink as the sun slowly makes its way up and another day arrives. 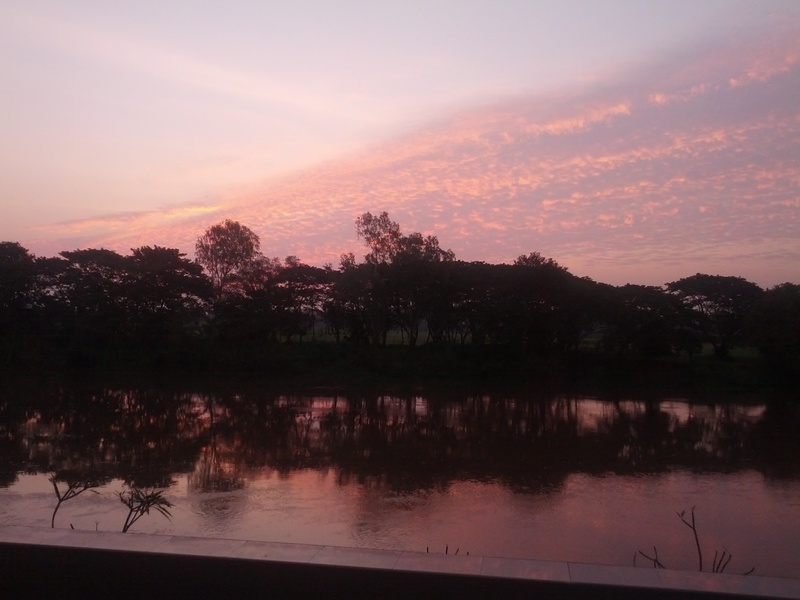 The sky glows in pink over River Naan, North of Thailand. Out peeks the sun. At risk of sounding clichéd, a new day has dawned. The happiest I’ve ever been is in the kitchen in the morning, coffee in hand, waiting for my toasts to pop out of the toaster, getting the butter and jam out, setting the table. That’s my happiest moment of any day. The smell of freshly made coffee and toasts is wonderful, don’t you think? I do. I love it. I’d wake up an hour early so I have time to go through my morning coffee-and-toast ritual. Even when I had to get to work at 5.30am I did. So I could sit and leisurely read my book, while nibbling on toast and sipping my French-pressed or moka-filtered coffee. What is it that makes this moment so special? For me, it’s the realisation that today is a new day. That I have a whole other day ahead, to do with it as I please. Even in my deepest, darkest days when a new day promises terror and yet more disappointment with myself, the knowledge that it could all end one day gave me a light at the end of the tunnel to look to. The possibility that life could somehow return to normal, and might well do. The realisation that I had reached rock bottom and survived – was surviving. I lived. I got through it. Life has returned to me, or rather I to it. Life is full of possibilities, as they say. And you don’t know what possibilities are on offer, what opportunities, what heartaches, until they appear. And that – to me – is the beauty of life. A lot has happened to me in 2013. To the end of my days, I’ll remember 2013 as the year everything changed. The thing is, though, I felt the same with 2012 at the end of it, and with 2011, 2009, 2007, and so on. The intensity varies. Naturally, as I get older, I become more reflective and learn more from my experiences over the past year. But it remains that a year always feels special when you’re living it. For me, it has always been difficult – if not impossible – to foresee how the next year can top the last. I’m feeling the same way about 2014. I’m quite confident I’ll be wrong. But I still can’t visualise how 2014 will pan out. And that – to me – is the exciting thing, the beauty – if not the essence – of life. Not knowing what life will bring, what it will put in the paths you choose to take. What fun would it be if you knew what was going to happen every step of the way? You’d be walking on a pre-determined path – be it by yourself, others, or the Man above. I don’t know about you. But to me that sounds horrible. So, as today breaks and I begin to live out one day of the rest of my life, I invite you to take a little moment to stop and think about what makes life beautiful for you. For me, it’s the unknown. And if you don’t know where to start, I suggest you watch this movie. I’ve never seen another movie that better captures the essence of life, the sheer beauty of it. And I watch a lot of movies. It’s a movie about life and love, and time. Do buy the DVD when it comes out. This one’s a keeper. And to end this somewhat bizarre entry, here’s my favourite bit from the International Trailer of said movie. I prefer the UK trailer (hence the above link), but this short father-and-son dialogue is what made me go see the movie. A decision I did not regret. Two hours well lived. Tim: Every day up to yesterday is lost. Dad: Just like for everyone else.